Found 2 file extension associations related to GIF Creator and 1 file format developed specifically for use with GIF Creator. GIF Creator has all essential image painting tools for editing images. It also provides 60+ preset effects to create animated GIF images with one click. Give you the most powerful ability to create GIF animation and edit GIF images. 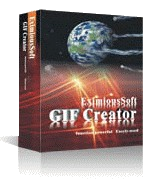 GIF Creator has all essential image painting tools for editing images. It also provides 60+ preset effects to create animated GIF images with one click. GIF Creator can produce the smallest size animated GIF pictures but without quality loss less, supports layer editing and undo, redo anytime anywhere. If you need more information please contact the developers of GIF Creator (EximiousSoft Team), or check out their product website.